1. Stainless steel lead screws why teflon coating is applied? 2. Teflon or PTFE solid lubricant get rid of what problems? 3. Teflon coated lead screw threaded linear stepper motor. Lead screws are one of the most common and cost-effective tools used to convert rotary motion into linear motion. Advanced materials and coatings allow them to be used in a multitude of applications, such as semiconductor manufacturing equipment, medical treatment devices, and rapid prototyping machines. One particularly useful function lead screws can provide is the ability to reduce or even eliminate the need for preventative maintenance. Since the majority of lead nuts produced today use polymers with integral lubricants, manually applied oil or grease may be omitted in many cases. However, if lubricant is simply omitted, a trade-off is that life and load bearing capacity will be reduced. An excellent alternative is to add a coating to the screw. The best coating to complement a polymer lead nut is a polytetrafluroethylene (PTFE) based solid lubricant. This type of coating includes other engineered polymers, in addition to the PTFE, which help it adhere to the lead screw and increase wear resistance and high temperature handling capability. 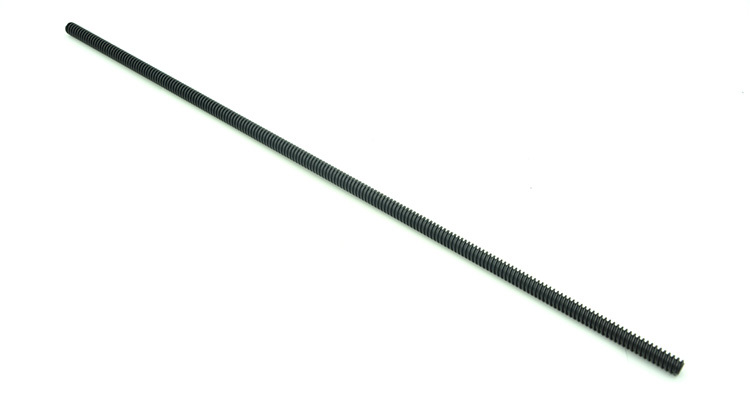 A 0.0005” to 0.0010” thick layer on the lead screw can provide several advantages, including reduced friction, reduced wear, and corrosion resistance. Application of a PTFE-based coating is usually handled by the lead screw manufacturer rather than the end-user because the process must be carefully controlled to develop the correct thickness and material properties. First, the lead screw is thoroughly degreased. Next, any part of the screw that will not be coated, such as end journals, is masked. The coating is then applied with air spray techniques, using several passes to develop a uniform thickness. This may be performed manually, or automated equipment may be used. Finally, the coating is cured in an oven. Several parts may be sprayed and then held to be cured in a batch oven. The result is a tough coating on the lead screw that greatly enhances performance over running without lubricant, and has several advantages over oil or grease. The friction coefficient of PTFE-based coatings can range from 0.06 to 0.12, which may be higher than the friction coefficient of oil or grease, but those types of lubricants must be maintained and cannot be used effectively in harsh and high particulate environments. While high particulate environments can reduce the life of any lead nut, using a solid lubricant rather than a liquid lubricant can greatly reduce the amount of life degradation because the solid coating will not attract and retain particles as fluid will. One characteristic that makes PTFE-based coatings a better choice than other solid lubricants is their ability to perform consistently over a wide range of conditions. For example, the friction coefficient remains relatively constant regardless of the magnitude of axial load. PTFE-based coatings display good resistance to acids, bases, solvents, and other environmental aspects such as saltwater, road chemicals, and ultraviolet radiation. They can be used in a wide range of temperatures, approximately -420°F to 550°F, and can even eliminate noise or vibration problems. One type of application well-suited to lead screws with PTFE-based coatings is office machines. In a copier, for example, a lead screw may be exposed to toner particles in the air and be required to last a long period of time at relatively high duty-cycle and without maintenance. Coated lead screws have also helped in the development of maintenance-free in-office rapid prototyping equipment. Life sciences, semiconductor manufacturing, and other fields where cleanliness is a major consideration are also great places to consider using a lead screw with a PTFE-based coating. One such application is a DNA sampling machine, where the use of a liquid lubricant could cause sample contamination issues. Two other lead screw coating options, though not as widely used, are modified tungsten disulfide and chrome plating. Modified tungsten disulfide performs a similar function to PTFE based coatings, but is used primarily with lead nuts made of bronze, rather than polymer. Chrome plating is especially useful for corrosion resistance in marine applications. While there are several options available for lubrication of a lead screw assembly, using an internally lubricated polymer lead nut with a lead screw coated with a PTFE-based solid lubricant offers the best balance of reliability, life, load capacity, speed, corrosion resistance,and maintenance requirements. Many application requirements have been met using this combination, and the number of applications specifying PTFE-based coatings continues to increase as more and more users discover its advantages.